In 1983, David Oshinsky’s book hit the stores. It detailed the life Joseph McCarthy and his fight against communism. The title reflected McCarthy’s deeply held belief about the size of the communist conspiracy, from Russia, that he believed existed to undermine and infiltrate the United States. Today, a conspiracy resides within the United States. The actions of the FBI and the DOJ under President Obama bring into question the very foundations of our system – a country designed to have a weak government that does not control our lives let alone choose our presidents. Today one of the players, Deputy Attorney General, Andrew McCabe stepped down. That is not nearly enough. 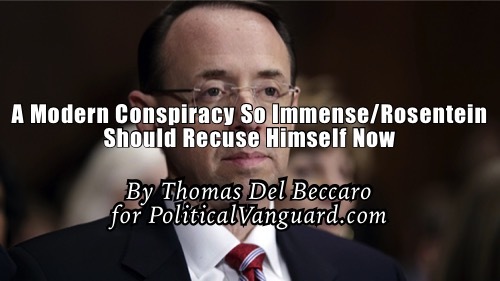 If that is true, then actions and the judgment of the Deputy Attorney General are in question because his request was based on the phony dossier. He needs to be questioned in the investigation if not investigated. Of course, Rosenstein wrote the memo for the firing of Comey. That makes Rosenstein a witness in that regard as well if the firing of Comey is being investigated. Given all of that that, Rosenstein should not be in charge of this investigation. Indeed, the need for his recusal is greater that Attorney General Jeff Sessions.